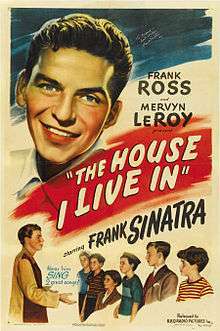 The House I Live In is a ten-minute short film written by Albert Maltz, produced by Frank Ross and Mervyn LeRoy, and starring Frank Sinatra. Made to oppose anti-Semitism at the end of World War II, it received an Honorary Academy Award and a special Golden Globe award in 1946. In 2007, this film was selected for preservation in the United States National Film Registry by the Library of Congress as being "culturally, historically, or aesthetically significant". Sinatra, apparently playing himself, takes a break from a recording session and steps outside to smoke a cigarette. He sees more than ten boys chasing a Jewish boy and intervenes, first with dialogue, then with a short speech. His main points are that we are "all" Americans and that one American's blood is as good as another's and that all our religions are to be respected equally. The song originally appeared in the musical revue, Let Freedom Sing, which opened on Broadway on October 5, 1942. Brooks Atkinson wrote in the New York Times: "Although Mordecai Bauman does not sing it particularly well, he sings it with earnest sincerity, without feeling that he must imitate youth by blasting the voice amplifying system and cutting a rug." In the film, Sinatra sings the title song. His recording became a national hit. The music was written by Earl Robinson. Robinson was later blacklisted during the McCarthy era for being a member of the Communist Party. He also wrote campaign songs for the presidential campaigns of Franklin D. Roosevelt, Henry A. Wallace, and, in 1984, Jesse Jackson. The lyrics were written in 1943 by Abel Meeropol under the pen name Lewis Allan. In 1957 Meeropol adopted two boys, Michael and Robert, who had been orphaned when their parents Julius and Ethel Rosenberg were executed in 1953. Meeropol was enraged that the second verse of the song was not used in the film. When the film premiered, he protested against the deletion of the verse referring to "my neighbors white and black". The song was memorably covered in later years by Paul Robeson, Mahalia Jackson, and Josh White. Sam Cooke also covered it. Kim Weston included it on her second post-Motown album This Is America (1968). Sinatra continued to include it in his repertory for decades. He performed it during a state dinner at the White House during the Nixon administration at the 1985 inaugural ceremonies of Ronald Reagan, and at the ceremony marking the centenary of the Statue of Liberty that same year. Bill Cosby used a recording of the song to open some of his shows in 2002. The song figures prominently in Arch Oboler's radio play "The House I Live In," which aired on April 26, 1945. ↑ "Frank Ross, 85; Producer of Films Made 'The Robe'". New York Times. February 23, 1990. Retrieved August 11, 2015. ↑ "Librarian of Congress Announces 2007 Film Registry" (Press release). Library of Congress. December 27, 2007. Retrieved August 11, 2015. ↑ Atkinson, Brooks (October 6, 1942). "The Play: Let Freedom Sing". New York Times. Retrieved August 11, 2015. 1 2 3 Cook, Joan (October 31, 1986). "Albert Meerpol, 83, a Songwriter, Dies". New York Times. Retrieved August 11, 2015. ↑ Decker, Todd (2015). Who Should Sing Ol' Man River? : The Lives of an American Song. Ocford University Press. p. 39. Retrieved August 11, 2015. ↑ Ripley, Anthony (April 18, 1973). "Sinatra at White House Gets Standing Ovation". New York Times. Retrieved August 11, 2015. ↑ Barnouw, Erik (2010). Radio Drama in Action: Twenty-five Plays of a Changing World. Wildside Press. pp. 388ff. Retrieved August 11, 2015.